Even though computer hardware prices have dropped dramatically over the last few years, it is still possible to spend several thousand dollars building a PC. Assuming that you want to keep the total cost reasonable, stop and think about how the computer will be used. This will help you best determine how to allocate your budget. For example, if the computer is going to be used as a gaming machine, you might choose to spend a good part of your budget on a high-end video card or two. On the other hand, if the computer will serve as a virtualization host, you might be better off spending the money on extra memory. Computers evolve at a feverish pace, and there is no way to future-proof your hardware. The eventual obsolescence of your computer is a sad fact of life, no matter how high end the machine might be today. 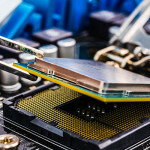 One thing you can do to help extend the lifespan of your new computer is to purchase a high-end system board. The system board as the one component that arguably limits your computer more than anything else. For example, your system board limits the total amount of memory that can be installed on the computer and dictates the system’s CPU architecture. Spending a little bit extra on a system board now might make it easier to upgrade your computer down the road. One lesson I have learned the hard way is that heat kills. If a computer gets too hot, the heat can damage the CPU. This can be an issue for almost any PC, but the problem of heat dissipation comes more pronounced on higher-end systems because they generally produce more heat. Consider the problem of heat dissipation when you’re designing your new system. Be sure to plan for an adequate number of fans and maybe even some liquid cooling. While I am on the subject of cooling, I want to mention that it is important to determine up front how you will power the cooling fans. Many of the cooling fans that are available today are designed to attach to a four-pin Molex connector (normally used for powering legacy disk types). However, some of the newer fans use a PWM connector instead. These fans are designed to plug directly into the system board, which can monitor the fan’s rotational speed. While this might sound good in theory, system boards have a limited number of fan connectors. For example, I recently built several new systems. The case I used had four fans installed, but my system board had connectors for only three fans (plus the CPU fan). As a result, I had to order an adapter for each machine that would allow me to plug the fan into a disk power connector.